Geographers from the University of Southampton on fieldwork in Alaska. Credit: Maarten Van Hard. 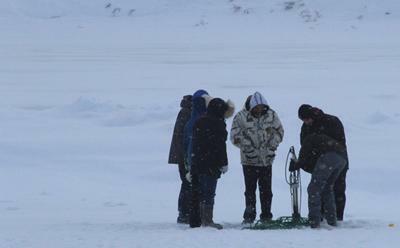 The team, who monitored 13,300 lakes using satellite imagery, have shown that on average ice is breaking up one day earlier per year, based on a 14-year period between 2000 and 2013. 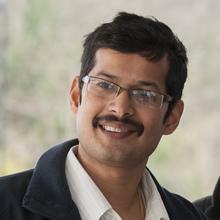 Their findings are published in the Nature journal 'Scientific Reports'. The researchers used information on how light is reflected off the lakes, as recorded by NASA’s Moderate Resolution Imaging Spectroradiometer (MODIS) sensor, which collects a range of spectral and thermal data on a daily basis as it circles the globe on two satellites. This study used the changes in reflectance to identify the freezing and thawing processes. The researchers discovered that all five study areas in the Arctic (Alaska, Northeast Siberia, Central Siberia, Northeast Canada and Northern Europe) showed significant trends of early ice break-up in the spring, but to varying degrees. Central Siberia demonstrated the strongest trend, with ice starting to break-up an average of 1.4 days earlier each year. Northern Europe showed the lowest change of ice break-up at 0.84 days earlier per year. They found a strong relationship between decreasing ice cover and an increasingly early spring temperature rise. The team also examined the timing of formation of ice cover on the lakes in late autumn. Although the use of satellite images wasn’t possible due to the short daylight period limiting valid satellite observation, observations on the ground suggest lake freezing is starting later – further shortening the ice period, although more work would be needed to confirm this. 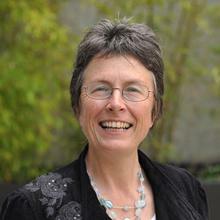 Professor Mary Edwards is Professor in Physical Geography within Geography and Environmental Science at the University of Southampton. She is also adjunct faculty member at ESTES, the University of Alaska, Fairbanks, and a Visiting Professor at the University of Tromsø Museum, Norway. 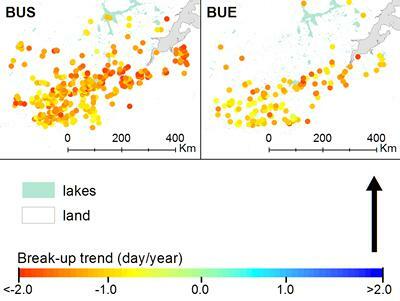 *Graphic image showing the spatial distribution and magnitude of all significant trends of breakup start (BUS) and breakup end (BUE) for Central Siberia. Each dot represents a lake for which a statistically significant trend was observed. The colour value represents the magnitude of the trend (this figure was drawn using ESRI ArcMap).